Imagine a trek through Jurassic Park right in your own back yard. 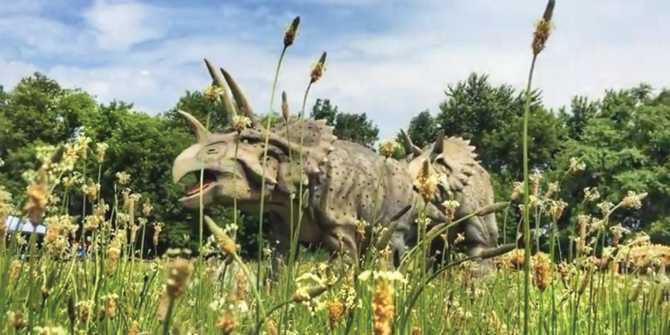 Field Station: Dinosaurs is working to build just that just five minutes south of Wichita in Derby, Kansas. With more than 40 hand-carved and painted animatronic dinosaurs built to scale, these out-of-this-world creatures will stand stories high and be brought to life for visitors and locals alike. From familiar dinosaurs to ones discovered right here in Kansas, get the family ready to explore and become scientists as you go on a journey unlike any other. Visitors will be able to explore popular dinosaurs like the Stegosaurus, Dilophosaurus, T. rex and the Brachiosaurus, but also lesser-known beasts like the Niobrarasaurus, Anzu and Quetzocoatlus. Guests will be able to play “Jurassic Golf” on a mini-golf course, play games, attend live shows and visit North America’s first challenge dome. The $11 million project expects to bring more than 100,000 people to the 14-acre park each year. The park is open rain or shine, and closed on Mondays unless noted. Tuesdays through Sundays from 10 a.m. to 6 p.m. Holidays: Open Independence Day (July 4) and Labor Day (Sept. 3). Saturdays and Sundays only from 10 a.m. to 5 p.m.
Fridays & Saturdays from 7-9:30 p.m.